Snow Mountain at Stone Mountain Park in Stone Mountain, GA outside of Atlanta. 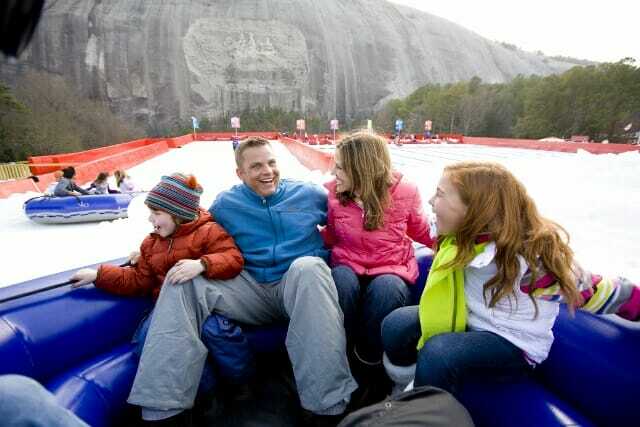 Located just 16 miles east of downtown Atlanta, your group will find the perfect spot for spring break fun, summer adventure, and year-round education all in one, Stone Mountain Park. This exciting attraction will allow your group to learn about geology and natural history, have some fun on sky-high ropes courses, catch a 4D flick, and even see a laser show on one of the world's largest screens, Stone Mountain itself. 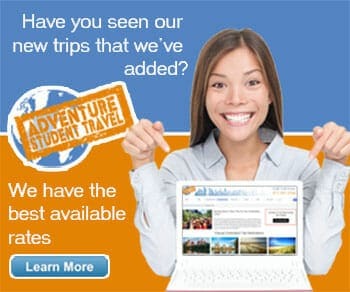 Your group can certainly spend a good half day or a full day here, with ample attractions and learning opportunities. There are performance opportunities for band, choir, or dance groups, the venue offering 20-30 minute slots for performance in front of Skyride. Below are the most popular attractions onsite! Dinosaur Explore (2017) - Experience over 20 larger than life animatronic dinos, and even get to dig and uncover your own big fossil! Geyser Towers - Multiple levels of rope bridges and net tunnels, the entire course overlooking an active geyser. SkyHike - Take part in one of the nation's largest aerial family adventure courses. Camp Highland - An attraction right behind Sky Hike meant for the kiddos, raised just 2-3 feet off the ground. Historic Square - Georgia homes, American revolution history, and Antebellum lifestyle insight. Scenic Railroad - A 1940s locomotive that will take you on a 5-mile ride. Summit Skyride - A high-speed Swiss cable car that will show you the Confederate Memorial, over 825 feet about the ground. Discovering Stone Mountain Museum - A chance to learn the story behind the main feature here, the world's largest relief carving. Lasershow Spectacular - Enjoy a 'multi-dimensional magic show' on one of the world's largest screens, Stone Mountain itself. Adventure Golf - An 18 hole mini golf course with a locomotive theme. Dinotorium - The 3-story indoor attraction with slides, bouncing floors, and climbing structures.